See all our class descriptions below. Hatha yoga is a generic term that refers to almost any type of yoga that teaches asana, the physical postures. The word “hatha” comes from the Sanskrit terms “ha” meaning “sun” and “tha” meaning “moon”. Thus, Hatha Yoga is known as the branch of Yoga that unites pairs of opposites currents in our system. It concentrates on the third (Asana) and fourth (Pranayama) limb in the Eight Limbs of Yoga. Hatha Yoga focuses on breathing and postures which are held for a while to benefit from their healing power. Because Hatha yoga’s pace is slow and gentle, it is an ideal starting place for people who are new to yoga. Vinyasa is a Sanskrit word for a phrase that translates as “to place in a special way,” referring—in hatha yoga—to a sequence of poses. Vinyasa classes are fluid, movements are intensive and the transition from pose to pose are conducted smoothly in a more vigorous pace. This form of yoga is a series of postures that work the cardiovascular system with its flowing movements and quick pace. All of the poses are linked and combined with a rhythm of inhalations and exhalations aimed to build heat in the body. Ashtanga is based on ancient yoga teachings, but it was popularized and brought to the West by K. Pattabhi Jois in the 1970s. It’s a rigorous style of yoga that follows a specific sequence of postures and is similar to vinyasa yoga, as each style links every movement to a breath. The difference is that Ashtanga always performs the exact same poses in the exact same order. This is a sweaty, physically demanding practice. Power Yoga is a fitness-based vinyasa practice. An offshoot of Ashtanga Yoga, it has many of the same qualities and benefits, including building internal heat, increased stamina, strength, and flexibility, as well as stress reduction. Teachers design their own sequences, while students synchronize their breath with their movement. The original Power Yoga was developed and founded by Beryl Bender Birch but is now a term used to describe many vigorous vinyasa styles. Swing Yoga is a new yoga style, a fusion of poses and exercises performed in a hammock to help you to reach more complex postures while working on your core strength and flexibility. Swing yoga defies gravity and allows you to perform various yoga poses that may be difficult to do on the ground, but easier in mid-air. Yin Yoga has the same goals and objectives as any other school of yoga; however, it directs the stimulation normally created in the asana portion of the practice deeper than the superficial or muscular tissues (which we are calling the yang tissues). Yin Yoga targets the connective tissues, such as the ligaments, bones, and even the joints of the body that normally are not exercised very much in a more active style of asana practice. Suitable for all levels of students, Yin Yoga is a perfect complement to the Hatha and Vinyasa, more dynamic and muscular (yang) styles of yoga that emphasize internal heat, and the lengthening and contracting of our muscles. Yin Yoga generally targets the connective tissues of the hips, pelvis, and lower spine. This class is based on the Taoist concept of yin and yang, opposite and complementary principles in nature. Yin is the stable, unmoving, hidden aspect of things; yang is the changing, moving, revealing aspect. In the body, the relatively stiff connective tissues (tendons, ligaments, fascia) are yin, while the more mobile and pliable muscles and blood are yang. In this class we incorporate the best from two worlds, warming up and targeting your muscles with the Yang part of the class and cooling down, releasing and stretching with the Yin part. Restorative yoga is simply that – restorative. It is the centering of your breath and body – aligning the physical and mental by practicing stillness for extended periods of time. The props assist in helping you in deep relaxation and to hold the poses for longer. to prepare for back bendy, hip/shoulder opening and splits. Hot yoga is practiced in a heated room with the temperature usually between 32-40 degrees Celsius. Classes are also often held in a room with an elevated humidity level. The purpose of hot yoga is to encourage sweating, which is believed to detoxify the body, as well as improve flexibility, boost stamina, improve overall fitness, burn calories, relieve stress and increase circulation. The essence of meditation is cultivation of mindfulness and expanded consciousness, moving beyond the mind’s chatter, and into peace and clarity of present moment awareness. Meditation goes far beyond the moments when you are actually in meditation, the aim is to reap the benefits and notice how it affects you in your daily life. It helps you to gain inner peace and grounds/calms you, it improves focus and self awareness, lowers anxiety and helps you to cope with stress, becoming more creative and compassionate, increases spiritual connection and it also helps regulating sleep. 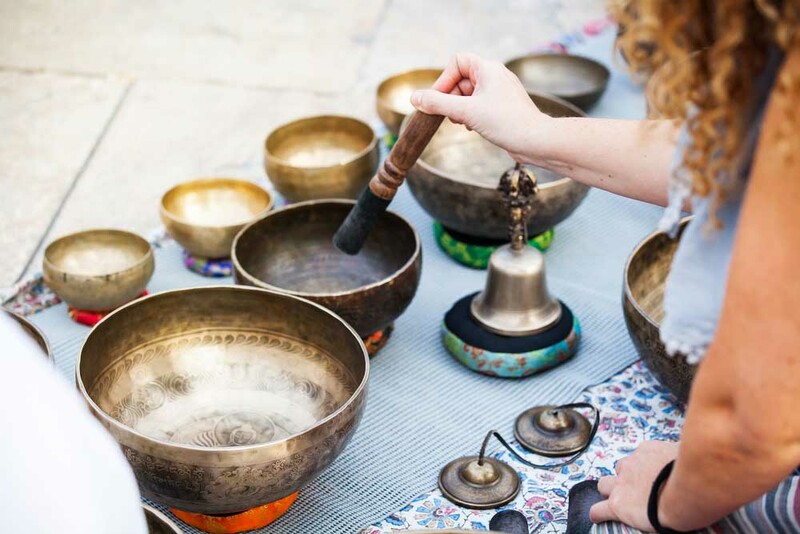 Sound Healing Meditation is a beautiful experience to relax your mind, body, and soul. shamanic drum, rain stick, Native American flute, and maracas, plus a special flow of the tong drum, chimes, and the monochord. You will be taken into a special energy cleanse, going deeper into the physical, mental and emotional bodies. Yoga Nidra is often referred to as “yogic sleep,” a paradoxical state of being between sleep and consciousness that’s conducive to deep emotional and physical healing, rewiring your brain, and self-exploration. As a culture, we’re always connected, often stressed, and our nervous systems are constantly in a fight-or-flight, sympathetic state. Yoga Nidra is an effective and efficient way to access the “rest and digest” parasympathetic state, which is where healing happens. Corporate Yoga classes are a great way to improve workplace morale, increase productivity and bring everyone together to do something fun as a group. Yoga can be a welcome break to a busy work day or a relaxing way to de-stress at the end of the day. We guarantee that each and every yoga class with one of our certified teachers will leave you and your co-workers refreshed, re-energized and ready to deal with workplace stress. We can customize a class to best fit the needs of your company and employees. You can come to you (your company might have common spaces include gyms, conference rooms, larger offices, rooftops suitable for our classes) or you are more than welcome to our studio!